Have you ever thought of ways you could grow your own pomegranate? It's possible! There are of course some basic guidelines, but if you follow them carefully, you could be enjoying your own fresh pomegranate fruit right from your own tree in a just a few short years. The most important task is to find a suitable place to plant your seedling. Pomegranates can grow in pretty much any soil, but make sure it's clear of weeds and that it will receive plenty of direct sunlight. It's critical to remove any dead or dried up plants from the area as well. The best way to get a pomegranate tree growing is to plant a seedling that has about one year of growth. You can grow the seedling from a seed yourself or purchase one from a reputable grower or nursery. Once you've decided on planting area, here is what you do next. Prepare a watering system prior to planting so it's in place before you plant the seedling. Turn the ground over in the area where you will place the small pomegranate tree. Use a pitchfork or hoe to make the hole for the seedling. Remove the seedling from the plastic by opening one side completely and then opening up the bottom of the bag to allow careful removal of the seedling from the plastic. Place it in the prepared hole and then cover over the entire root system. Mark the plants with a small stick or garden marker so they aren't mowed off or walked over. Water the ground thoroughly after planting to give the plant ample water to get started. During the hotter months of the year, you should water it a bit once a day for the first 30 days. During the second month, you can water once per week and it will still do very well. Once your tree has a good trunk, you'll want to destroy any small branches that grow around the trunk of the tree. After your tree is very healthy and has several branches, you'll need to do some pruning. Small orchards – you can prune all the branches except for 4 or 5 larger, healthier branches. The middle of the tree should be kept completely free of small branches. Larger orchards – keep the center of the tree open and clear of small branches and make sure the tree doesn't grow taller than 2.5 meters in height. Protect your pomegranate fruit by removing any harmful insects or bugs from your tree and fruit. Take time to visit your local gardening expert and get advice on how to best protect your tree from insects that could destroy or eat all of your fruit. Some pomegranate growers take the time to wrap each fruit in specially made white paper bags in order to keep bugs and insects away from the fruit while allowing plenty of sunshine through to nourish the fruit. When the fruit begins to grow, you need to pick the fruit once it reaches the right size, which is when it's reached the size of a grapefruit or softball. Don't pick all of the fruit from the tree at once. Instead, allow around 100 fruits to remain on the tree at any given time. 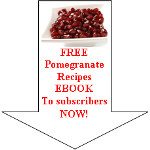 Read enough about grow your own pomegranate and want to discover more about the pomegranate tree?